What happened at school on Thursday morning was simply wrong. A step towards a positive environment with the ability to have dialogue about student issues was twisted into a public spectacle of immaturity, and that’s too bad. The actions taken by a percentage of the student body on Thursday were disgusting. Watching the news and seeing one’s school being disparaged as “the students who rioted over lavatory passes” should make any student cringe. Savagely running through the halls and displaying such a blatant disregard for the privilege of public education is simply sad. Students calling for mature treatment yet spiraling into rage only proved the district’s logic in restricting freedoms. Immaturity will never be met with mature privileges. Yes, being a teenager has always come with a heightened need to defy authority in the hopes of becoming an adult and making decisions for oneself. Questioning rules is a natural part of growing up. But a complete disregard for authority cannot be condoned. There are children on the other side of the world that would gladly trek miles to have the opportunity to attend a school like East or West, but on Thursday, West Bend students saw an opportunity to skip class and they devoured it. That the behavior on display was wrong and deserves punishment is a given. And yet, as social media explodes with rumors and judgments, perhaps a larger question needs to be considered. Maybe it does not matter what people were chanting or whether or not “sticking it to the man” was effective. The larger question students, educators, administrators, and parents need to consider is why such a simple sheet of paper can spark such an explosive response. 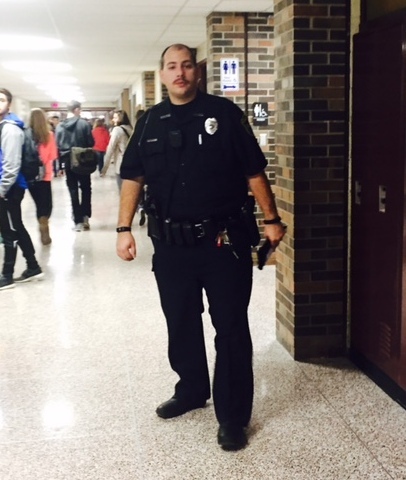 There was an increased police presence at WBHS throughout the day on Thursday. Perhaps these bathroom lanyards were simply the straw that broke the camel’s back. The conflict of conjoining the high schools was only resolved last month. This week seniors were notified that they would no longer be participating in the drunk driving awareness program Every 15 Minutes (participation has since been returned to seniors). A school tradition of the senior class having a mural to leave behind in the school was also temporarily taken away before being returned. The AP class exam policy also has faced changes this year with an end-of-year exam being required in addition to the AP test. Discussions about “data” are constantly interfering with richer learning experiences. Amidst all these changes, many students feel like they are being suffocated with policy changes, mixed messages, and widespread confusion. Changes in school policy often are misunderstood by students as a result of administration not openly keeping students informed. Intended or not, decisions seem hidden, and the logic is not easily understood. Policy decisions seem to leave out the most important factor: the actual impact on students. To students, trust seems misplaced with school board members and the powers-that-be. Administration has become a haze hanging over the school that has become policy-happy. To many students, a principal is simply a concept, a threat, and a stack of blurry rules, not a person leading them to a destination of learning. Even if the goal is to better the learning environment, as more and more rules are set in place, students are beginning to feel like animals kept in cages. And we don’t know why there is a sudden need to treat us like numbers rather than partners. Thursday’s events may not be an issue of hall passes; perhaps it is a call for action. Clearly students feel as though their voices are not being heard. When a child craves attention, and doesn’t know how else to be noticed, he or she lashes out. Part of the student body threw a temper tantrum Thursday. It wasn’t constructive, but it might be illustrative. 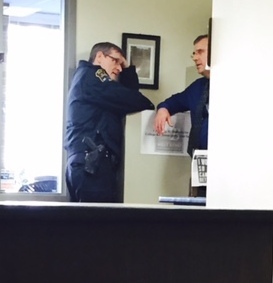 Bill Greymont, head principal, consults with a police officer on Thursday. The new hall pass is a symbol for something much bigger. On Thursday, it was used as a scapegoat for every disgruntlement students have ever felt, whether it be AP exam exemptions or a simple disrespect for authority. Some disgruntlements may be more relevant or more intelligently developed, but when it comes to the business of student education, the district as a whole might need to reflect on customer satisfaction. As for the student body and the problems they both impose and face, some deeper thought needs to be given. Students have rights. Students have a right to feel safe at school. Students have a right to receive a quality education that will prepare them for life’s trials and tribulations, and students have a right to feel as though their voice matters and their thoughts are being taken into consideration. Of course, being a student also carries responsibility. As community members, future adults, and the future of a nation, we as students have to give serious consideration about what it means to be a productive citizen. Soon the world will be in the hands of students, and it will be a frightening place if new hallway regulations are enough to inspire a mob. Maybe if people wernt so immature they would not have even changed the passes to green. thanks. This article is an amazing example of how our youth can perceive our society. To those leaving messages that being an unimportant member in their jobs and therefore the society at large, I feel bad for you for forgetting the importance of high school and your own teen years. Our adolescent years are spent learning about our potential to make changes in our world, mostly through history classes that teach us that those who have made substantial changes are those who protested the way things were. Some remained peaceful, others did not. They are learning that they are not important people and they are stuck in a world where they can not make improvements, while being told about people who have made changes. Is it really any surprise that they pushed for change in the only ways they know. We should honestly be grateful that things did not get worse than they did. It only takes a single person out of control to create a mob, and the mob mentality. Anyone close enough can be affected by this, not because of who they are or how old. It is a testament to the school that it did not become a bigger issue than it was. I only hope the administration may come to understand this, otherwise they are only going to make things even worse. Lauren, I am so proud of your thought-provoking writing. Thank-you for this important discussion of student concerns.